[product design features] Because the elders in the friend's family are not allowed to hang the Christmas wreath, the designer has the idea of making a wool crochet wreath. 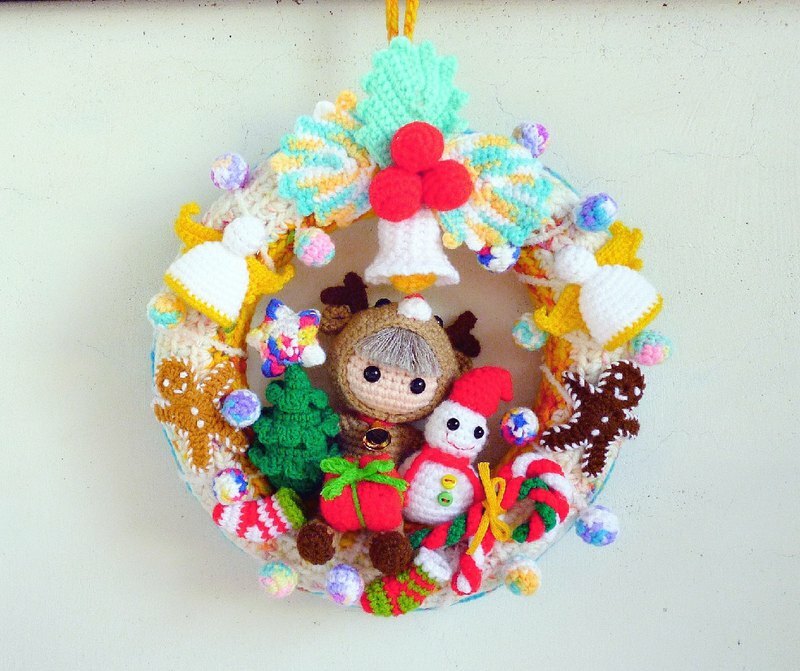 Carefully designed combination of weaving and accessories, each small ball, every Christmas equipment ..... to the reindeer dolls, are designed by the designer to crochet, the same kind of hooks and then combined into a wreath. In order to use delicate and small crochet, it is especially costly and eye-catching. Unique is only one. It takes a month and effort and brain power for a piece of work from scratch. I hope you will love it and cherish it. ※**fifth photo for this page wreath with another wreath of the size of the fineness of the reference photo**! ※※**flower rabbit hand-woven works as each one is unique in the world**,**does not love to do repetitive**! ※**There are any questions or special care details**,**Please ask beforehand**,**then make an order action**! [Material and Washing] Fine wool and cotton Use a light dirt for daily use. Wipe it with a wet towel and dry it. If you feel that it is smelly or wet for a long time, wipe it with a wet towel or rinse it with a small amount of water. 【size】 Flat measurement: The body diameter is about 20cm Reindeer doll is about 9cm high (error is about 1~2cm) [Flower rabbit hand made the original intention and small 叮咛] 1. **flower rabbit hand made**is in honor of the designer's rabbit angel and create a pure hand-made brand,**love delivery**are hand-made rabbit flower began selling hand works in mind. 2. **currently sold for use on all income to spend hands-fed rabbits and rescue TNR partial wave after wave Township**,**is willing to force the small pea to make the world a better place**~ 3. **Hand-knitted and stitched**, there may be some imperfections,**best area to be taken when the fabric is cut**,**drawing will be different**. 4. **Everyone's screen settings are different**, so the actual product and the screen display,**may have a slight color difference**. 5. handmade,**for color and workmanship requirements perfectionist**,**please think twice before buying**. 6. **order to protect the package, it will not be stressed for a long time due to the weekly break**,**not send the parcel package on Friday**. 7. **Saturday Day for Family Day and Material Purchase Processing**,**Do not ship**(except special orders),**Free to return message**. 8. **Not full-time non-exempt orders**, if there is a specified time limit arrival date, please confirm the order before the order, do not place the order directly, can not be assigned a reasonable meeting. 9. **Non-24 hours online**, please contact us if you have any questions, wait patiently, and you will reply and process it in the first time!